The Clan Crest embodies the heart and soul of the Donnachaidh tradition. The hand holding up the crown is an allusion to the the Donnachaidh Chief's services in capturing the murderer of King James I in 1437 AD. When encircled with a strap and buckle bearing the chief's motto, this crest can be worn as a badge by all his family and clan. 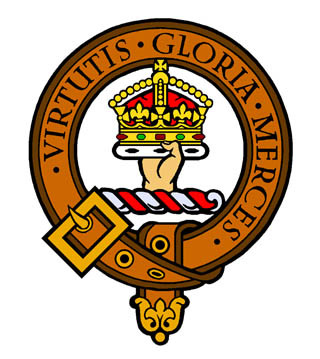 The Clan Donnachaidh motto Virtutis Gloria Merces translated from the Latin reads "Glory is the reward of valor". The Clan slogan or war cry is the Gaelic Garg'n Uair Dhuisgear, which is translated "Fierce when roused", and pronounced GAR-n OO-air GWISH-gyar. For more details on our clan symbols see the CDSTI Member's Handbook. The famous Robertson device of three wolf's heads appears on their seals as early as 1438. In those days their homeland of Atholl was still the haunt of wolves, but the reason for choosing this device has been lost: if it could be shown that the wolf was an heraldic beast of Clan Donnachaidh's ancestors, the Earls of Atholl, it might just possibly be conjectured that it was a pun on the name of their forefather Madach, first Earl of Atholl, since Madach resembles madadh-allaidh: the Gaelic for Wolf. When a leader died, his heir succeeded to his coat. As the coat of arms of Struan Robertson was three silver wolf's heads on a red background, each successive Chief of Clan Donnachaidh has succeeded to it: just as The Queen has succeeded to the Royal Arms. By Act of Parliament nobody may use a coat of arms unless it is registered in the books of the Lord Lyon, who has a duty to decide to whom it belongs by right in any generation and is therefore called upon to judge disputed questions of chiefship. Since no two men can use the same coat of arms, other sons have always had to add some mark of difference to the arms of the head of their house, so that they can be told apart. These "differences" are selected for them by the Lord Lyon, who is expert in such matters, and are carefully recorded in the books of his Court. 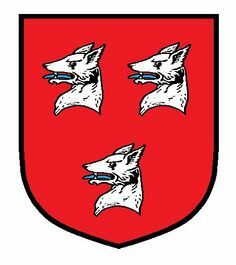 Thus in 1779 Robertson of Lude asked Lyon to record his arms, and was allowed the three silver wolf's heads on red, with a golden hand holding a cross, placed for difference between them. This was especially appropriate, as a hand holding a cross is an emblem of Clan Donald, from an heiress of which the Robertsons may have inherited Lude. So strict is the rule about "one man, one coat," that during his father's lifetime even the heir has to wear a "label" or tournament collar over his father's coat, so that he won't be confused with his father. During the Middle Ages another custom arose, that of wearing large emblems called "crests" on top of helmets; so that they stood out above the scrimmage at at tournament. (An early Earl of Atholl, cousin of the Robertsons' ancestor, was murdered because of jealousy at his prowess in a tournament.) These crests were made of light wood or boiled leather and were joined to the helmet, the join being concealed by a wreath of twisted silk in the family colours. Later on a metal plate showing a chief's crest (the roll of twisted silk came to be depicted rather like a barber's pole) used to be work suspended by a strap around the neck of his retainers. So nowadays a chief's crest, WHEN ENCIRCLED WITH A STRAP AND BUCKLE BEARING HIS MOTTO, may be work as a badge by all his family or clan. The Robertson chief's crest is a hand holding up an imperial crown, in allusion to the then chief's services to the Crown after the assassination of King James I in 1437. His mottos is Virtutis Merces Gloria (Lat. "Glory is the reward for valor. "), and his slogan is Garg'n Uair Dhuisgear (Gael. "Fierce when roused. ", pron. GARG-n OO-air GWISH-gyar). Many chiefs have plant-badges as well, which can also be worn by their clansmen. The Robertson plant-badge is bracken. In the case of great men, the arms came to be held up by figures called "supporters." These supporters are in Scotland only allowed to certain institutions and also to peers, chiefs, and certain lairds holding very old feudal baronies. The supporters usually stand on a grassy mound called a "compartment," often strewn with the plant-badge. But the Robertsons of Struan have a remarkably rare honour of a special compartment, granted them in memory of their capture of the principal slayers of King James I in 1437. This special compartment consists of a wild man lying in chains on whom the Robertson chief's shield rests. When a chief is allowed supporters to his arms it is a great compliment to his clan, as it marks their importance, and such chiefs are admitted to the Standing Council of Scottish Chiefs. Struan Robertson's supporters are a Serpent and a Dove. They are collared with bows of the Robertson red, and the dove wears a baronial cap-of-maintenance (When a family lost the lands of its old barony, as happened to Struan in 1854, the cap is coloured blue, but it has the usual ermine brim.) The Serpent and the Dove allude to the origin of Clan Donnachaidh in the kindred of St. Columba, for they refer to a pun on the saint's name. Another of the same kindred, King Alexander III, made the pun on his privy seal seven centuries ago: Esto prudens ut serpens et simplex sicut columba , "be wise as the Serpent and as gentle as the Dove." The whole "achievement" of shield with coat of Arms, held up by supporters and resting on its special compartment, together with crest on the helmet and with the motto and slogan, makes up the Arms of Struan Robertson, as recorded for the Chiefs of Clan Donnachaidh in the Public Register of all Arms and Bearings in Scotland. For the Simplicity of the coat, for the immense antiquity of the supporters' significance, and above all for the great honour of the special compartment, their achievement is notable in highland heraldry.